Here are four examples of jealousy from the Bible. There is no better example of jealousy than Joseph’s brothers, but there’s also no better picture of how destructive jealousy can be, and it all began when “Joseph had a dream, and when he told it to his brothers they hated him even more. He said to them, “Hear this dream that I have dreamed: Behold, we were binding sheaves in the field, and behold, my sheaf arose and stood upright. And behold, your sheaves gathered around it and bowed down to my sheaf” (Gen 37:5-7), but his brothers were outraged and said, “Are you indeed to reign over us? Or are you indeed to rule over us?” So they hated him even more for his dreams and for his words” (Gen 37:8). Part of the problem was that Joseph was Jacob’s favorite son as Jacob gave Joseph a coat of many colors, symbolic of his prominence in Jacob’s eyes, so as Joseph “came near to them they conspired against him to kill him. They said to one another, “Here comes this dreamer. Come now, let us kill him and throw him into one of the pits. Then we will say that a fierce animal has devoured him, and we will see what will become of his dreams” (Gen 37:18-20). Instead, Joseph is sold into slavery by his brothers, but much later, they would discover their jealousy, which was clearly sinful, turned out to do much good (Gen 50:20). Instead of singling out a person as an example of jealousy, I decided to include the whole church of Corinth. Why? Because the Apostle Paul writes to the Corinthians that “you are still of the flesh. For while there is jealousy and strife among you, are you not of the flesh and behaving only in a human way? For when one says, “I follow Paul,” and another, “I follow Apollos,” are you not being merely human” (1st Cor 3:3-4). They started to be jealous of one another over who they followed! Elsewhere, some were battling over whether food that was sacrificed to an idol should or should not be eaten, so Paul says “Shall we provoke the Lord to jealousy? Are we stronger than he” (1st Cor 10:22). He reminds them that “love does not envy or boast” (1st Cor 13:4), meaning that envy and jealousy are closely related. 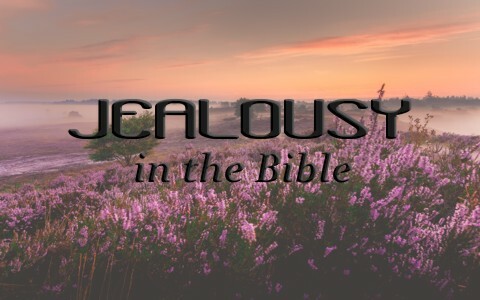 Being jealous is not always wrong because God is a jealous God (Ex 20:5) that despises worship of other gods and so Paul wrote, “I feel a divine jealousy for you, since I betrothed you to one husband, to present you as a pure virgin to Christ” (2nd Cor 11:2). The Corinthian’s were also coveting the gifts that others had, but as we can see, jealousy was a trademark of the church at Corinth. Jacob the patriarch had two wives but only one brought him children…at least in the beginning. Jacob loved Rachael but not Leah, so “the Lord saw that Leah was hated, he opened her womb, but Rachel was barren. And Leah conceived and bore a son, and she called his name Reuben, for she said, “Because the Lord has looked upon my affliction; for now my husband will love me” (Gen 29:31-32), and after Leah’s third son was born, Leah said, “Now this time my husband will be attached to me, because I have borne him three sons” (Gen 29:34), but “When Rachel saw that she bore Jacob no children, she envied her sister. She said to Jacob, “Give me children, or I shall die” (Gen 30:1)! Finally, “Rachel said to Leah, “Please give me some of your son’s mandrakes.” But she said to her, “Is it a small matter that you have taken away my husband? Would you take away my son’s mandrakes also” (Gen 30:14-15)? Rachel’s jealousy is understandable in this case, but her jealousy caused Jacob to have other children through someone who was not his wife. The lesson is that jealousy can often lead into sin. After King Saul lost his thrown due to his disobedience to God, God had David anointed to be the next king, but Saul wanted to make sure David never sat on the throne and so he chased him down like an animal, trying to kill him. Before this happened, Saul gladly used David’s skill in defeating Israel’s enemy, but when “the men were returning home after David had killed the Philistine, the women came out from all the towns of Israel to meet King Saul with singing and dancing, with joyful songs and with timbrels and lyres. As they danced, they sang: Saul has slain his thousands, and David his tens of thousands” (1st Sam 18:6-7), “Saul was very angry; this refrain displeased him greatly. “They have credited David with tens of thousands,” he thought, “but me with only thousands. What more can he get but the kingdom?” And from that time on Saul kept a close eye on David” (1st Sam 18:8-9), but “When Saul realized that the Lord was with David and that his daughter Michal loved David, Saul became still more afraid of him, and he remained his enemy the rest of his days” (1st Sam 18:28-29). Sadly, David would have greatly benefited King Saul and Israel, but because Saul was jealous of David, he became his enemy, showing how much damage a jealous spirit can be to someone but also to those around them. Being jealous is close to coveting what someone else has or a position that someone holds. Joseph’s brothers were filled with jealousy over him, the Corinthian church had a problem of being jealous of one another’s spiritual gifts, and Jacob’s wife Rachel had that problem too, just like King Saul in being jealous over David. What we can learn from these examples is that there is no reason to be jealous of one another. God is not going to respect one person over another. We are all God’s children and have unique calls in our lives, so rather than be jealous of others position or possessions in life, why not accept what God has done through their lives and work together for the common good of the church, because a house divided cannot stand, and a little bit of jealousy can do a lot of harm to others and even to one’s self. Why isn’t the story of Lucifer’s fall? That was a major story of jealousy! Good point sir, but the best examples used were of humans but you do make an excellent point sir. Thank you. This is very great,will use it in my ministration.. Thank you for the wonderful compilation. first envy should be Cain and Abrl right? Speaking of Pilate at the trial of Jesus. Great example Nino. Thank you. Previous post: Why Did David Take 5 Stones Against Goliath? Next post: How Can I Know When God is Speaking to me?